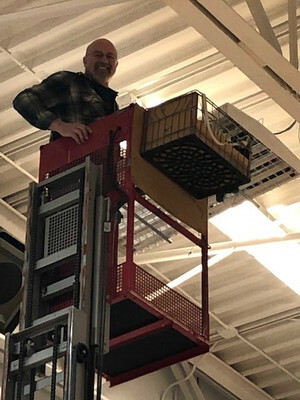 Cecil Cretton, Head Custodian, installing the new light bulbs in the gymnasium. Many thanks to the M&M Area Community Foundation, with funding from the C.S. Mott Foundation - Clean Energy Initiative, for the $3,500 grant to update lighting at the School District of Niagara. New LED light bulbs will be installed in both of the gymnasiums and all emergency lighting in the district will be updated. In addition, the Niagara School District received a $2,050 Focus on Energy Rebate for this project. The M&M Area Community Foundation has also provided energy educational opportunities for both our staff and students. Ms. Nicole Anderson and Ms. Maryellen Wagener took part in a K-12 Energy Education Program (KEEP) training through UW-Stevens Point. This training program focused on assisting our teachers in integrating clean energy and energy efficiency education within their science classroom. Students then used their energy knowledge while playing the “Cool Choices” game online with other school districts. These educational opportunities are allowing our students and staff to certify our Middle School as a Green and Healthy School.